Ram Air kites are for advanced kiteboarders and hydrofoils that want to push the limits of speed and lite wind possibilities. These kites require maintenance and tuning to work correctly. Liquid Force offers the Elite at a lower price and a less complicated bridal system. The Liquid Force Elite is a closed cell Ram Air kite, but don't let that scare you. With the explosion of hydrofoil kiteboarding, foil kites have grown new wings in the kiteboarding scene. As a result, there's a good chance you have been seeing these kites in the water where just a few years ago you would only have seen them used in snowkiting. So, maybe you are wondering, what's up with foil kites? Well, as a recently converted hydrofoil kiteboarder, let me tell you. First of all, these are not beginner kites. Ram Air kites have been around since the beginning of kiteboarding, but with the invention of the inflatable kite, they virtually disappeared from the water. They continued, however, to be the kite of choice for snowkiting where their technical advantages are undiminished by their shortcomings on the water. The main crux, of course, is the water relaunch. While Ram Air kites are water launchable, it is a time-sensitive operation. With some practice and experience, they can be relaunched efficiently; however, once they take on too much water it's time to swim for land. So, what are these technical advantages? A properly tuned and pressurized foil kite has a very flat profile giving foil kites optimal projected area and making them highly efficient. The absence of bladders makes them super lightweight and gives them an otherworldly stability and the ability to perform in extremely light wind. The combination of lightness and efficiency allows them to fly closer to the edge of the wind window, in fact, when you first fly one, you'll swear it's flying right out of the window. Their lightness also gives them drift characteristics unmatched by any inflatable kite. They behave, in this respect, more like a gas than a solid. Especially in light wind, the kite doesn't feel like a massive object struggling to stay in the air and more like a cloud that just floats wherever you put it. The result is that foil kites perform way better than inflatables both upwind and downwind. The fact of the matter is that foil kites can run circles around inflatables and if not for the water relaunch issue we would all be riding them. So, to talk about the Elite more specifically, the Liquid Force Elite is, as mentioned above, a closed cell ram air kite, meaning it gives you more time to relaunch it before it takes in water. That's a plus and so is its use of water repellent fabric. 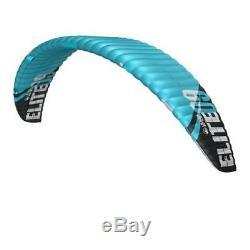 Designed by renowned foil kite designer, Benoit Tremblay, the Elite offers faster pressurization due to its unique double barrel air intake ports while its baffle system increases air cell communication. In other words, it inflates quick and stays inflated well. Performance-wise, the Elite has excellent stability, massive boost, awesome drift, ridiculous drift, and huge depower. Everything that is great about foil kites, the Elite delivers in spades. Bottom line: If you are an intermediate to experienced kiter looking to harness the advantages of a foil kite, the Liquid Force Elite is easy to use high-performance foil kite that will make you a convert, especially if you are riding foil boards. Listing and template services provided by inkFrog. The item "2018 Liquid Force Elite" is in sale since Tuesday, January 9, 2018. This item is in the category "Sporting Goods\Water Sports\Wakeboarding & Waterskiing\Wakeboards". The seller is "forcekiteandwake" and is located in Mount Pleasant, South Carolina. This item can be shipped worldwide.